I had the opportunity recently to attend AdaCamp Montreal, an “unconference” devoted to increasing women’s participation in “open technology and culture,” from Wikipedia to open-source software. While attendees were brainstorming ideas for potential sessions and workshops on the mailing list a few weeks before the event, I had a flash that this would be the perfect place to run a workshop for women thinking about getting into public speaking or wanting to improve their presentation skills. The 2.5 hour workshop time slot was perfect, so when it came time to pitch ideas on the first day of AdaCamp, I went for it. 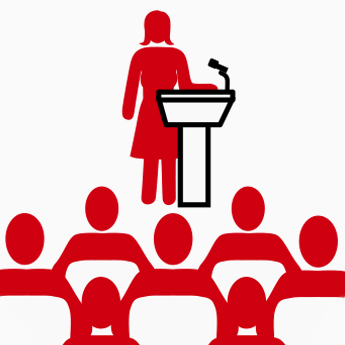 On April 14, I ran the workshop for a group of women with varying levels of public speaking experience. They shared what’s stopped them – from feeling too busy to lack of confidence – and brainstormed the benefits of giving presentations – from being seen as an expert in your field to serving as a role model for other women. Each participant wrote up a pitch for a presentation, and they shared constructive feedback on each others’ proposals. We looked at what makes great slides, common mistakes that new speakers make, and how to handle challenging question-and-answer sessions. I had a chalk board available for the first time giving this workshop, and I took full advantage of it – fun and useful! I look forward to seeing what these women do next in the public-speaking world. Photos (cc 2.0) by Eva Blue. See more of her photos from AdaCamp Montreal.